The House of Training - ATTF offers a large number of international training programmes, both in Luxembourg and in the partner countries. These trainings in and outside Luxembourg, are largely financed by the Luxembourg government for all those partner countries listed on our website (see: Partner Regions). The main objective of offering seminars in Luxembourg is to create superior programmes with international best practices providing the participants with first-hand exposure in the international context of the Luxembourg Financial Center. 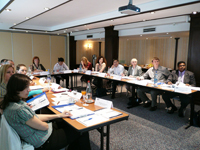 The advanced courses complement efficiently the programmes we already deliver abroad. Our partner countries require increasingly specialist training, oriented towards international best practices, using case studies and examples, and employing practical and applied trainers over and above purely academic seminars. These kinds of trainings are very often not available in their countries, where the depth of the materials may require several highly qualified trainers. For this reason we also offer seminars in Luxembourg where there are highlighted needs in specialized areas notably Risk, AML & Compliance, Capital Markets & HR for banks. The objective of the House of Training - ATTF is to effectively transfer financial knowledge to its partner countries and this involves, on a regular basis, the delivery of seminars locally in the countries that are being worked with. Local delivery in many cases is more cost effective, accessible for participants and has greater alignment to the needs of the country concerned. Not all courses however are suitable for "export" and may only be available as seminars in Luxembourg. Persons from countries not listed on the House of Training - ATTF's website are welcomed to look up our non-subsidized training courses on https://www.houseoftraining.lu/. They may also send us a request through the House of Training - ATTF contact form. Definitely, there will be many things applied during my activity; also much of already existing will be reviewed (refreshed) based on newly acquired knowledge.